Designed by software developers for software developers. Easy to Adapt. Easy to Extend. One of the easiest ways to get to know the Joomla! Framework is to start with looking at a sample application. This site is powered by the Joomla! Framework and serves as a great example of using the Framework. Download this website application repository from GitHub. Why build the Joomla! Framework? A great example is the issue tracker for the Joomla! CMS. Developers are encouraged to take an active approach with the Framework, including future updates and development. If you find a problem or bug and can fix the issue directly, then you can fix the issue and submit a pull request against the repository. Not sure how to get started with submitting a pull request? You can view pull request tutorials in the Joomla! Documentation wiki. If you find an issue in a Framework package and cannot fix the issue directly, then the next step is to report the problem. Issues can be reported on the Joomla! Framework organization under the appropriate package. Submitting an issue here will help everyone track issues in a central location. Please be available to add comments and respond to questions related to your issue as other developers begin assisting in writing code to fix the issue. More information regarding reporting issues can be found here. Perhaps as you're working with the Framework you find a feature or an issue that you are simply unsure about how to use it. In this case, it would not be appropriate to attempt either of the steps listed above. You can take advantage of the Joomla! Framework mailing list where you can get help from other developers. Be respectful and courteous in the mailing list and you will receive quick helpful feedback to help you better utilize the Framework to its full potential. A tried and tested method of communication, it is a quick and easy way for you to ask any questions, offer suggestions, and voice your opinion. Are you a GitHub Junkie? Wanna dive into the exact code, or grab it straight from the source? Then GitHub should be perfect for you. Open Source Matters serves the financial and legal interests of the Joomla! project. By supporting them you are directly supporting the Joomla! project itself. Are you an RSS buff? Get the latest developer news at your fingertips. Subscribe to the Google Group mailing list. Also, it already has been adopted by the likes of eBay for internal use. Some of the code offered by Joomla! 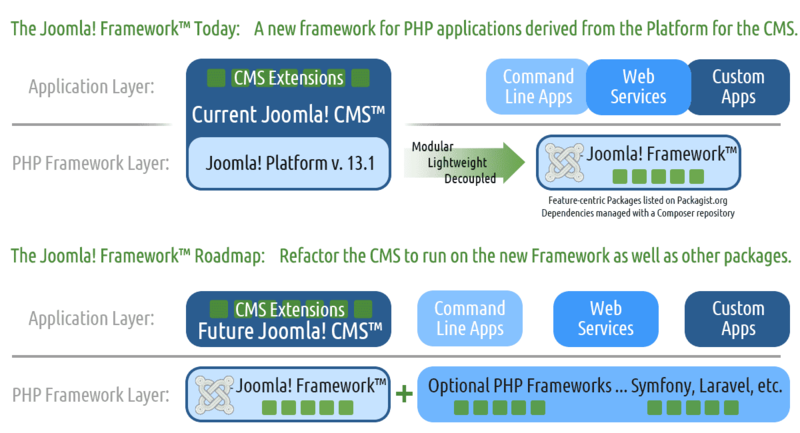 Framework is already included with the Joomla! CMS. Other packages will be included in future Joomla! CMS versions as needed. Join the Google Group and let us know how you have implemented it.